These 20 Potato Soup Recipes are perfect to keep you warm and full all winter long! I know potatoes sometimes get a bit of a bad reputation for being higher in carbs than other vegetables, but I love them. After all, they’re also very nutritious with Vitamin C, B-6, Potassium, and Magnesium. Plus, they go well with just about any other flavor. We always have a bag of either white, yellow or red potatoes and also sweet potatoes in our pantry. They’re a great cheap pantry staple and can be used so many ways. I love them in a hash for breakfast, a soup for lunch, or roasted with dinner. The past couple weeks it’s been very cold for coastal Virginia, and we’ve even had a few snow storms, so I’ve had soup on the brain. 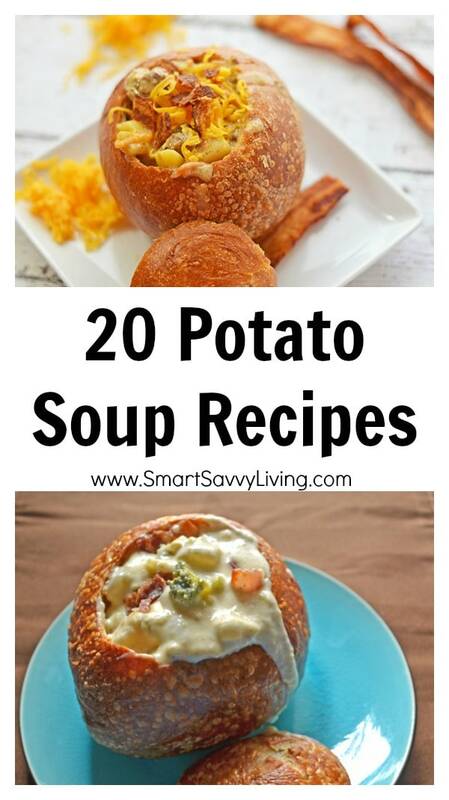 As I mentioned before, potatoes go well with all sorts of flavors, so I decided to collect 20 potato soup recipes to try that you can find below. Follow Smart Savvy Living’s board Soups, Stews, Chili and Sauces Recipes on Pinterest. Which of these 20 Potato Soup Recipes are you going to try first?